We’ve got another ‘My Top Three’ with a twist. This time it’s the choices of the great minds at TRiCKETT, who bring you there top three sports stars. Iain – Jackie Robinson – I have kicked off (or should that be pitched off? Doesn’t have the same ring) with someone, who in my opinion made sport a better place. Certainly in America. 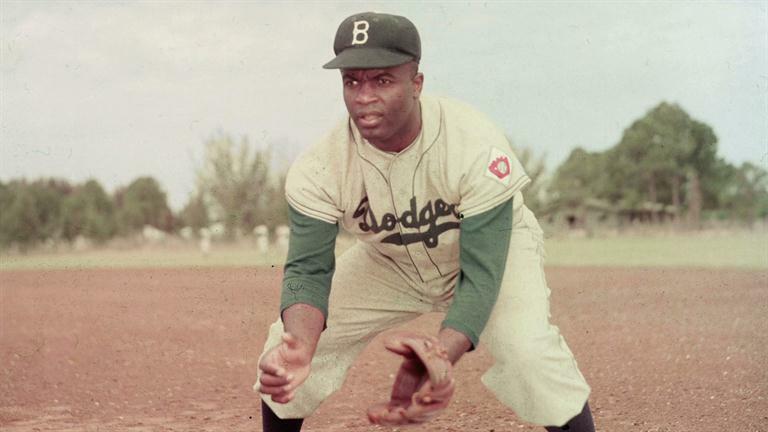 Jack Roosevelt “Jackie” Robinson was the first African American baseball player ever to play in the major leagues. He had a bad attitude, put up with being called all kinds of unimaginably evil things, hated being famous, detested his father and by crikey could he hit a ball. An inspiration to anyone that has ever had to overcome any form of hard ship to play their sport. I still dislike the Dodgers though. 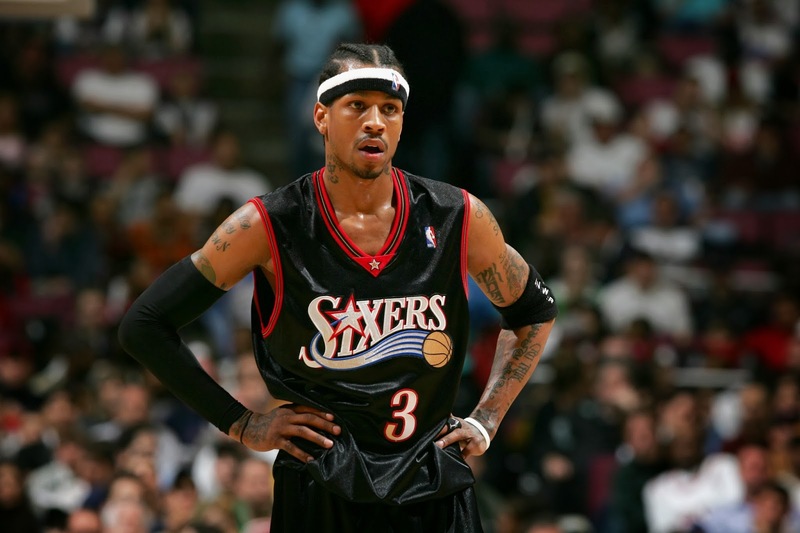 Fern – Allen Iverson – ‘Practice, we talkin’ about practice here.’ If you know what that means then you are probably in agreement with me about A.I. Couldn’t dunk, but could break your ankles when you do that weird thing when you are in a supermarket and a person is walking towards you and you want to get past and you both go the same way twice and you get all embarrassed. A character, who only looked like he enjoyed playing when it was for the 76ers and I had a poster of him backing my geography book. I loved A.I and his crap tattoos, I always thought we were going to get married. 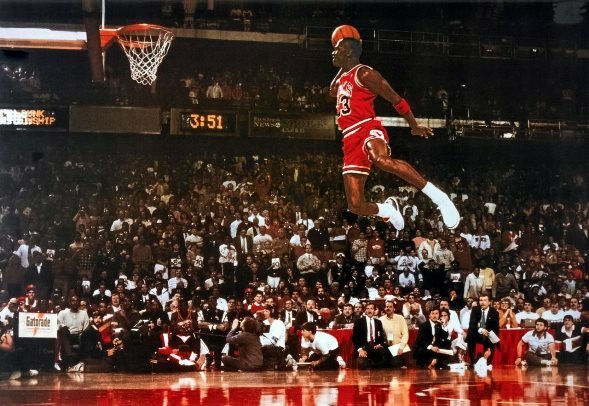 Iain – Michael Jordan – For me the most important sporting personality ever to play any form of sport. He combined being incredibly talented, having really nice shoes, being a reasonably OK person (he was a bit overly competitive like) and having an ego to go with it all. This is what contemporary sport for me misses, yes there are a few personalities, there are a few extremely talented individuals, some nice people and even some nice shoes. However, I don’t think that we will ever get that combination again in sporting culture. He was also great at defence and attack, which is a true rarity in any sport. 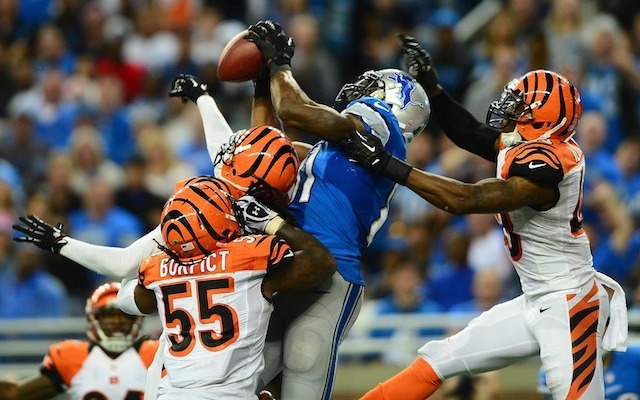 Fern – Calvin Johnson – MEGATRON. When you knock something over in you house and it looks like it should have broken on the floor, but it didn’t, that wasn’t an accident that was Calvin Johnson catching it and putting it down safely. This man could catch anything and he is probably at his peak now. 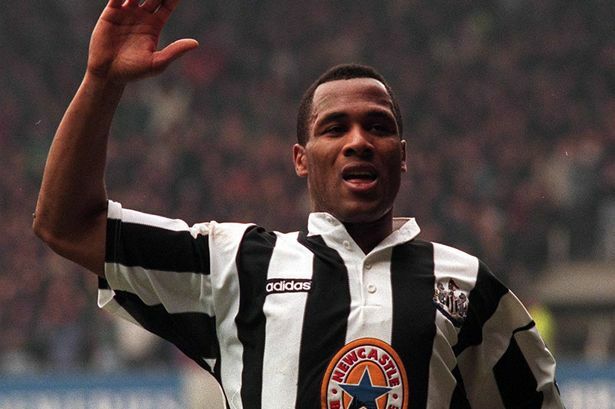 Iain – Les Ferdinand – I had two fairly good choices and then I saved the very best until last, Les Ferdinand. Good in the air, played in one of the most iconic football strips, in one of the most iconic ‘nearly’ teams of all time and he was the first person that I ever got on the back of a football shirt. What was good about Les was that when in the playground if you wanted to be him, you were pretty much nailed on that you could be. Anyone could be Shearer or Cantona. Only a very strange child from Accrington could be Sir. Les. Fern – Andrea Pirlo – I am no football pundit, as all my shirts have normal collars and I haven’t played for Liverpool or Manchester United, but Andrea Pirlo is one of the most interesting players to watch on a pitch. He doesn’t do much but when he does, you’re 1 – 0 down crying at your centre back “he moves at the same pace as a slug, how did this happen?” Beard, wine, drunk on buses, beautiful and has great socks. What more do you need?! Massive thanks to Fern and Iain for this, if you like clothes designed by people with a genuine passion then head over to the TRiCKETT site, they send free sweets with their orders as well.